In the dead of summer and your Air Conditioner has called it quits, you need AC repair. In Greensboro, Central Carolina Air Conditioning provides 24-hour air conditioning repair so whether your AC goes kaput in the middle of the night or on the weekend, Central Carolina Air Conditioning is the one to call to get your system back up and running. What do you do once you realize the Air Conditioning has gone out? Pick-up the phone and call Central Carolina Air Conditioning at 1-800-461-3010. If it's after 6 PM or on a weekend, one of our on-duty technicians will respond in about an hour to discuss your AC repair and get your address. Our technicians will arrange a time to arrive at your residence fully equipped to handle repairs to your heat source. You can also request emergency AC repairs using our online form. The form will give you an indication of the questions your 24-hour AC repair technician will ask when responding by phone, questions such as where your Air Conditioning system is located, how many thermostats you have, the type of Air Conditioner system you have and give you an opportunity to share notes about things you may have noticed about the Air Conditioning system lately, such as whether it's dripping water, making noises before it quit working, or emitted a strange odor. Your answers will help the technician in diagnosing the issue and knowing which extra tools or parts to bring to get your Air Conditioning system back up and running. Better yet, don't wait until an emergency to become a Central Carolina Air Conditioning customer. 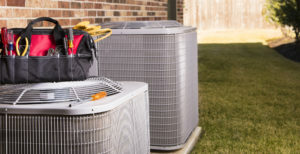 We offer excellent HVAC Service Agreements that give us the opportunity to regularly service and maintain your Air Conditioning system, keeping it in peak working condition, so that you can avoid emergency Air Conditioning repairs in Greensboro over the life of your Air Conditioner. Plus, you can rest assured that if you do have an emergency in the middle of the night or on a weekend, you still get 24-hour AC repair service from the best HVAC technicians in the business. In addition, Central Carolina Air Conditioning, Plumbing & Electric uniquely offers a Whole House agreement to give you have the peace of mind of knowing that the major systems in your home are regularly maintained and when you need us, "we've got you covered."